Reserve Champion was awarded to Summer Place, owned by Pony Lane Farm, and ridden by Maggie Jayne. 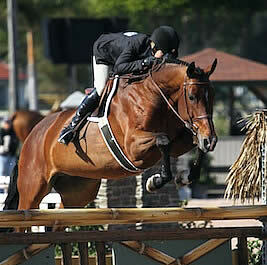 Jayne and Summer Place were awarded ribbons in each jumping class, including three seconds and a third. Farmer, who hails from Keswick, VA, has been riding Rosalynn for about a year and a half. However, only recently did Glefke and Farmer actually purchase Rosalynn, a 9-year-old Oldenburg mare by Lanciano. “She is just laid back and tries really hard,” beamed Farmer. Farmer had only positive things to say about the addition of a new division to the hunter line-up. The fence height in the High Performance Working Hunter division is the highest offered for hunter riders and horses to compete over. “Anything that lets horses with the ability to jump this high and showcase their talent is a good addition,” stated Farmer. Action continues tomorrow and through the weekend for hunter and equitation divisions at the Palm Beach International Equestrian Center. While the professional hunter divisions came to a close today, the amateur and junior divisions will continue. Among the competition for championships tomorrow will be the Camping World Amateur Adult 51 and Over Hunters, Section A. Horses and riders will be on course beginning at 8 a.m. in the E. R. Mische Grand Hunter Field. 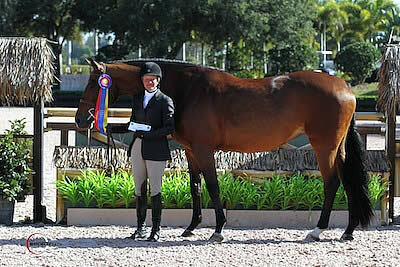 For full results please visit www.shownet.biz and for more information, please visit www.equestriansport.com. Previous PostYann Candele and Redefin Triumph in $30,000 WEF Challenge Cup Round 1Next PostEventing Radio Episode 114 by Bit of Britain – A Way Forward for the US Team?